An account of how Republican legislators and political operatives fundamentally rigged our American democracy through redistricting. While the work is extraordinarily timely and undeniably important, Daley’s ­argument is perhaps a bit too zealous. No doubt this sinister practice has effectively destroyed congressional cooperation, but one has to wonder, especially this election year, whether America’s partisan divide really is simply the result of nefarious mapmaking. The rise of an angry, inchoate political force — one that has not only bucked party orthodoxy but maintained widespread grass-roots support — would seem to lend credence to the idea that progress on big-ticket issues relating to the environment and economy is not stalled just because of this miserable redistricting process, but indeed because of a growing and seemingly unbridgeable gulf between the haves and have-nots, urbanites and ­ruralists, insiders and outsiders. Salon editor David Daley’s punchy, though overstated, new book lays the blame for Republican power in the House on partisan gerrymandering, the byzantine process through which state legislatures draw district lines to favor incumbents from one party...Daley’s book provides a blow-by-blow account of how this happened. He draws on investigative reports, interviews and court documents to give readers an eye-opening tour of a process that many Americans never see...But the problems created by gerrymandering are symptomatic of larger challenges facing the parties. Daley should have looked more deeply into what’s going on with the Democrats as a national organization that caused them to allow Republicans to gain so much power in state politics. Daley’s account of REDMAP’s craftiness is compelling—so compelling that it almost undoes itself. If gerrymandering is all-important, it’s hard to explain how REDMAP ever got anywhere. In 2010, Republicans were dealing with lines that had, in several key states, been drawn by Democrats. Yet the G.O.P. managed to win control not only of state legislatures but of Congress. Daley addresses this problem by presenting 2010 as an electoral outlier...He finds the situation so disheartening that he proposes the whole election system be revamped. States, he suggests, should return to the multi-member districts that were popular back in Patrick Henry’s day. There is no reason to expect this or any other reform to be enacted. Pretty much by definition, gerrymandering suits those in power. 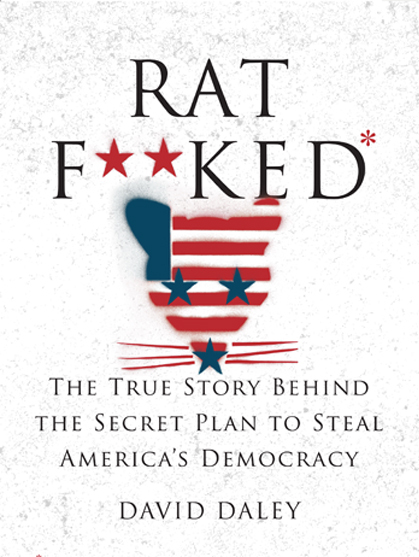 What did you think of Ratf**ked: The True Story Behind the Secret Plan to Steal America’s Democracy?